The efficiency of a UPS system has a direct influence on energy costs and the cooling required. 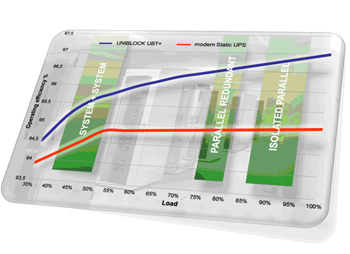 With an efficiency of up to 97%, the UNIBLOCK+ sets new standards in the UPS sector. The new UNIBLOCK+ range efficiencies are quoted with the energy storage connected. 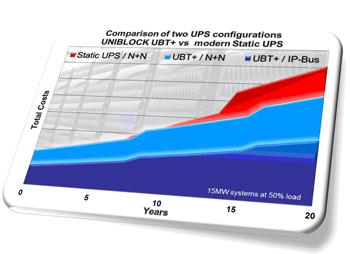 This means that in all UPS Configurations the UNIBLOCK+ saves costs - day after day, year after year. The Total Cost of Ownership (TCO) is a combination of the capital expense for the UPS, the electrical operating costs, the routine maintenance and overhaul. 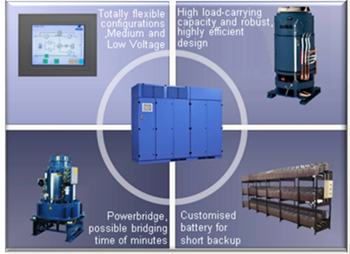 It is also dependant upon the required surrounding infrastructure which has to include switchgear, cabling, power factor correction and cooling needs together with building space costs and reduction in net useable space. When properly addressed, the TCO analysis will often show that there is a significant reduction in pay-back period if the right solution is adopted. 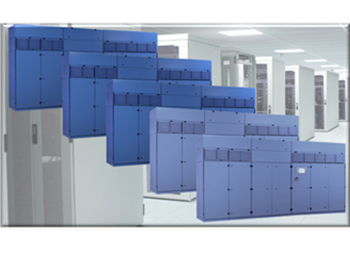 The Number of active units in a parallel system is automatically adapted to the load. For the same nominal power the UNIBLOCK UBT+ provides more active power (approx. 25%) than conventional UPS systems. This allows more loads to be connected. The same concept can be used to address low and medium voltage applications, cooling can be by air or chilled water, ride through storage can be batteries, flywheel or mixed. Can be independent, with standby generator or with cogeneration.